I had decided to spend my 20 days vacation this time in India and soak in the culture. I wanted to visit Delhi, Goa and Kerala in my trip . This article is not going to be about my trip, but rather about how to get India E-Tourist visa for UK citizens and how you can get your visa cheaper than official government fees. UK citizens seem to love this move and now occupy the top spot among all the countries who have applied for India E-Tourist visas with over 239,000 applications in 2016. How to get India E-Tourist visa for UK citizens below government fees ? This is how I got my visa at £73(actual fees is £87). This works best if you have not booked your flight, hotel and insurance for your India trip. You will receive an email from indiavisainfo.com about your visa fees in 1 hour. Your visa fees can be anywhere between £0 to £95. You need to just accept the quote no payment needed yet. Do UK citizens need a visa for travel to India? All foreign nationals visiting India must possess a valid travel document (Visa) for entry and exit from India. India offers visas based on the purpose of your visa, you should be careful while choosing your visa. Having an inappropriate visa may lead to denial of entry to India. Is it possible to get Visa on arrival in India for UK citizens? Unlike the earlier days, India does not provide visa on arrival for foreign nationals. ETVs replaced the visa on arrival systems in November 2015. Effective November 2015 it is mandatory for citizens of the UK visiting India to have a valid visa before arriving in India. How to choose the right Indian Visa for you? E-Visa: This is an online visa for business, tourism or short duration medical treatment purposes. Regular visa (Sticker visa): This is your regular visa which is stuck in your passport. You will need to visit the Indian embassy in your city (with an appointment prior to your visit) and attend an interview. Once you complete the formalities then your visa will be stuck in your passport and will be valid for 10 years Usually this visa can be any of the following. Conference Visa, Diplomatic Visa, Employment Visa, Emergency Visa, Entry Visa, Journalist Visa, Medical Visa (for long-term treatment), Missionaries Visa, Tourist visa, Permit to re-enter within 2 months, Research Visa, Student Visa Transit Visa, Intern Visa, and Film Visa. UK citizens who wish to travel to India solely for tourism purpose for a period of up to 60 days can apply for an India E-Tourist visa. E-Tourist visas have to be applied a minimum of four days prior to your journey. What are the documents needed for getting India E-Tourist visa for UK citizens? You only need to submit two documents while applying for an Indian E-Tourist visa. However, you chose to use one of the visa agents, then all you will need to do is send an iPhone pic of your passport and photo to them and they can edit it to suit India visa requirements. Here is an image explaining the requirements by one of India visa processing agents. You need to be careful while uploading the scanned copies of your photograph and passport. Even a small deviation from the above-given specification can lead to rejection of your application. The India visa agent who does all the application process for us accepts photographs and scanned copies in any format. Later they would edit them both to the required specification and initiate the application process. On the other hand, If you plan on doing the application process by yourself make sure that you have all these required documents in the required format and specification. Apart from all these documents you also need to have a lot of patience too!! Online scams have started thriving in the past few years. Lately, this menace has spread to the visa processing sector too. In fact, we have seen a lot of fake India visa agents who offer visa services at very high costs with the claim that they will get your visa approved in a day. You need to keep in mind that India visas are issued by the government of India and it is clearly given in the official website that it takes a minimum of 2 days for approval. Also, you will find many websites online which are “designed” to trick you into applying for a visa with them ($300 for an “express” visa ?). Be wary of these websites. Ideally, with most agents, you will need to make an initial payment of anywhere between $10 to $30 and once you are given the confirmation that your visa is being applied, only then make the full and final payment. Be very careful with these websites and agents, you do not want to end up being a scam victim. indiavisainfo.com: This is one of the agents with whom we have worked with in the past. Your visa application will be taken care of by one of their experts. Will charge you $50 for getting you India visa. If you need help with only completing the payment for your application, then you need to pay only $25. indianvisaonlin.gov.in: This is the official website of Indian immigration department. Frequent server crashes make this site unreliable. There are a lot of issues with the payment portal too. There will be absolutely no customer support from them. Be very careful when you deal with any other websites before you give an advance. It is advisable to talk with the agent and clear all your doubts and queries before initiating a payment. How much does it cost the UK citizens for Indian E-Tourist Visa? India E-Tourist visa fee for UK citizens is £54. Banks charge an additional 2.5% of the above amount as their service charge. If you sought the service of a travel agent, then expect to pay anywhere between £20 to £40 extra as a service fee. There are basically two ways to apply for an India E-Tourist visa. One is to apply through the official website of Indian government which of course is a hideous task as there are lots of issues with the website and the payment portal. The other way, which we recommend is to apply through a reliable India visa processing agent who will take care of your visa processing at a minimal cost. The agent we would recommend is indiavisainfo.com because they have a workforce of dedicated and experienced visa agents. We had to pay just $25 to begin the process and once we got the visa, we had to pay them the full amount. Also, they accept payment via Paypal which is safer since you are protected by PayPal for any fraudulent transactions. 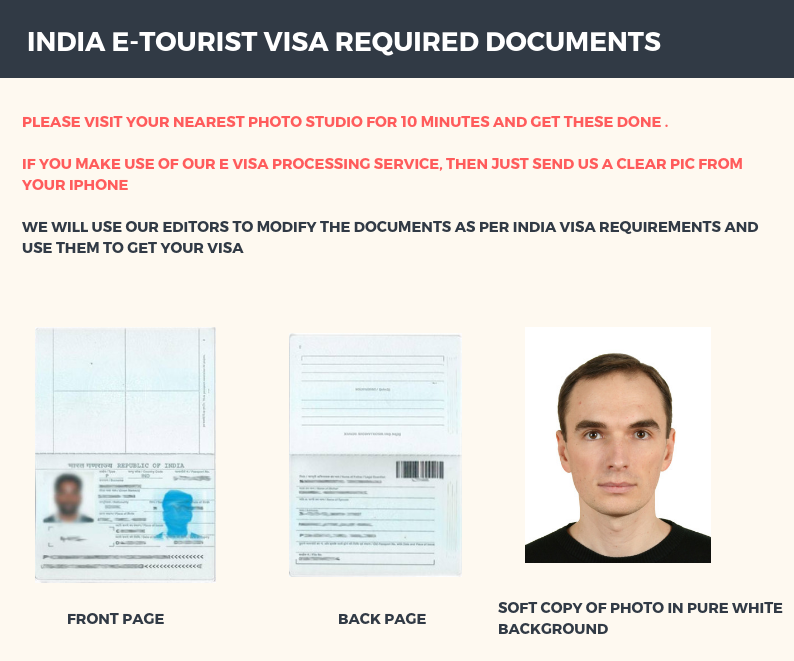 Applying for India E-Tourist visa with an agent? Visit indiavisainfo.com (click the link to open in a new tab). Follow the simple guides given below. You will have to make a payment of $25 initially. Once you submit the form an agent from the agency will call you within 2 hours will be assigned to you to take your visa process further. They speak good English as well so you will not have any problem. If you are satisfied with them and make a payment they will start applying on your behalf ASAP. Once your visa is approved they will contact you with a Visa ID which you can verify from the official website and make full payment to get your visa. E-Visa stands for Electronic visas and as the name suggests, the application has to be made online. Enter the details about your passport, personal details and the port of arrival. Before you continue make sure that you have all the required documents in scanned PDF format and photograph in jpg/jpeg format. Step 4: Make the payment (Visa Fee). Introduction of E-Visa was supposed to make the whole process a lot easier. The poor planning and implementation of the website make it one of the most unreliable and abysmal systems one can find on the internet. There are 2 major issues with the website. The payment portal is very unreliable because it may crash anytime unexpectedly. Apart from the unreliability Indian government does not plan on making things easier for you. Only 3 attempts are permitted to make a successful payment. Failure to make a successful payment in 3 attempts will result in blocking of your application ID. The SBI (state bank of India) bank’s ePay solution is ill-equipped to accept cards from international customers.Furthermore, this complaint is persistent even on their internet banking solution that they offer. Another problem with the portal is the unreliability of the main website. The website where you have to fill in the application form and generate an application ID may crash anytime. The most annoying one would be when you are almost at the end and the site going unresponsive when you click submit. Therefore, the only solution to this is to have a lot of patience or hire a visa agent who can get the job done for you. You can avail their service to get your visa without any trouble because these visa agents have so much of experience in this field and they keep monitoring the situation on a frequent basis. No, India replaced the earlier visa on arrival system with E-visas. It is mandatory for foreign citizens to have a valid visa before arriving in India. Validity of E-Tourist visas is 60 days, earlier it was 30 days. None of the E-Visas is extendable or convertible. You need to very careful while choosing your visa. The visa fee is non-refundable. You will not get a refund if you cancel your visa. I have received my Indian Visa from your agent whose name is Linda. And also she help me to get edit my flight itinerary. Your customer support is really awesome. I received the Indian EVisa so quickly.Thanks for arranging the earliest slot.It was helpful. It was the first time I was applying for a Visa in this website. And my Expectations on visa approval was high. At last I got my visa approved. It is just because of your help at right time. We were just planning to visit India . And I was looking to get visa for this countrY . Then I got a complete guidance under your customer support. Your services were really good. I appreciate it highly. Thank you for securing Our Visa . I thought you could not arrange that for me. But you guys did it for me however. So much thanks to you. The best website to get the Indian e-visa perfectly done. Really money worth service. We were planning to visit India for the coming vacations and was looking in Google for the website who provides better offers for Indian eVisa. And while I enquired with my colleagues I got a suggestion from them that you guys are really doing good business in this field. And your services was really useful for me after I booked through your website. Final word for Indian eVisa Service will be this website. Really helping customer support to solve all the queries which I had. The active customer support itself is a really help for us to solve our problems online. Thank you! ← How to Apply for Germany Schengen Visa from Los Angeles Consulate?